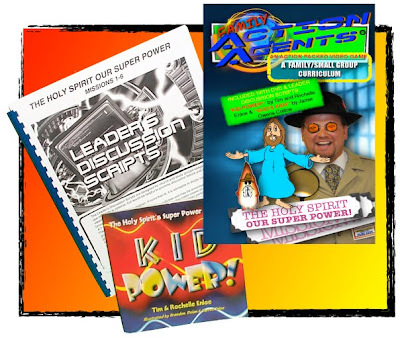 A brand new DVD curriculum about Spirit Baptism for elementary-aged kids is now available from familyactionagents.com. It is loosely based on our children’s book, “Kid Power!”, and contains six interactive 20-30 minute segments suitable for children’s ministry, small groups or family time. Inspector Clueless leads the way to a biblical understanding of the Holy Spirit’s power with great special effects and practical teaching metaphors designed to help kids understand and receive the Baptism in the Holy Spirit. “The Holy Spirit: Our Super Power” is now available for $39 and includes DVD, book and leader’s guide/script. Click here and scroll to the bottom left to find a preview video and ordering information. This entry was posted in Books/Resources, Speaking in Tongues/Glossolalia, Spirit Baptism, Spiritual Leadership. Bookmark the permalink.